I’ve been thinking about the rubbish again, and to help me out with my yoghurt pots and tin foil I have called upon the services of Tracey Smith and her ‘‘. “The information in this book should help you live more simply,” says Tracey, “with dramatically reduced levels of rubbish.” Perfect. The book is an amble from room to room in a typical house, detailing how to reduce waste. There’s information on composting, what can and can’t be recycled, and lots of ideas for little projects. Some of these are things to do with rubbish, others are more ways to avoid it in the first place. Lots of little facts too, like the daily worldwide sales of biros* – 14,000,000 – all of which will end up in landfill for thousands of years. Or did you know that there are 14 million ground-up glass bottles in the M6? 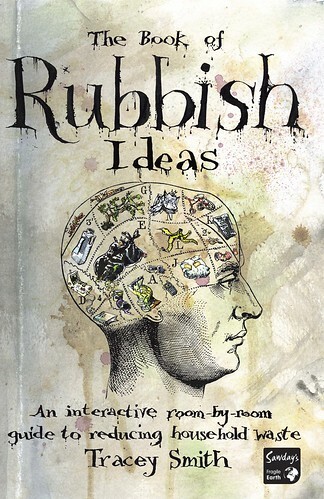 The Book of Rubbish Ideas is an easy and entertaining read. As well as all the inspiring ideas, all the contacts and resources you need are at the back, so there’s no excuse for throwing so much away. For more serious facts, politics and statistics I’d recommend Richard Girling’s ‘Rubbish’. To do something about it, pick up this one. Tracey, who also came up with , has . *If you’ll permit me a history geek moment, the ballpoint pen was patented in 1931 by two Hungarian brothers, Laszlo and Georg Biro, a journalist and a chemist respectively. It was popularised by the Royal Air Force in the Second World War. When I was little I wanted to be an inventor, and the thing I most wish I invented is the ballpoint pen. Compost bins are wonderful and plants really thrive on it! Yes, I’ve never had a garden until this last year, so I’m looking forward to getting one started. Hi Jeremy – just a shortie to thank you so much for your lovely posting and for helping me spread the good, green word even further. This was very interesting. We’re so used to wasting resources, we don’t even realize it.